I produce TV and I write book reviews for Barnes and Noble, and I understand what goes into production and what it takes to make a video about a book. It’s not easy; in fact, counting cars as they enter the car wash can sometimes be far more interesting than watching one of these book trailers. Many of them present no more information than dissolving from one stock photo to the next and then offering up the title. They certainly don’t make me think, “I must stop what I’m doing right this second and click the buy button.” That changed when I viewed the book trailer for ‘Miss Peregrine’s Home for Peculiar Children.” I was interested, surprised, afraid and most of all curious. Curious enough to buy the book. I believe the difficulty starts with imagery; no two people’s imagination is the same. If an author described a woman as having long flowing red hair with a petite nose – we would both have a different picture in mind. See – two different images, but both potentially describe what the author has written. 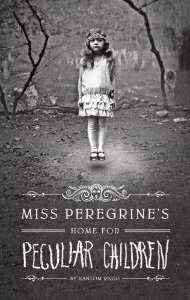 In contrast, the book “Miss Peregrine’s Home for Peculiar Children” is based on vintage photographs and the author, Ransom Riggs uses them to illustrate his book and his book trailer. Mr. Riggs is a writer and a filmmake who clearly knows a thing or two about production. Using live action in combination with compelling narration and some very unusual photos, he has produced a riveting book trailer. See for yourself – I think this is one of the best book trailers out there, I can only hope the book lives up to the preview. I 100% agree! I saw the trailer for the 1st time about a week ago (I’ve watched it a few more times since then) and it did exactly what it was suppose to do…. it made me want to read the book. Now, as you mentioned, I hope it can live up to this fantastic trailer.